Sylvester McCoy is the Doctor in No Man’s Land. Even though its been nearly one hundred years since the 11th of November, 1918, the horrors of World War I remain a firm part of British culture. Once called “The Great War” in the hopes there would never be another, the conflict brings forth the thought of “trench warfare” – great lines dug into the ground, brimming to the teeth with machine guns and filled with young men praying that they never will be ordered to go “over the top.” For between the trenches of the Allies and the Central Powers lay no man’s land – a stretch of ruined land riddled with barbed wire and land mines, where ruined buildings and artillery crates waited to snare the unwary. No man’s land was a killing field for both sides until the rise of tanks late in the war, and even then, the soldiers ordered to make the attack risked finding themselves injured at the hands of the enemy, begging silently for the end of the conflict, the arrival of stretcher bearers (who would hope that the other side wouldn’t take a shot at them), and a chance to rest behind the lines, either praying for a wound that took a long time to heal, perhaps sending them home…or, for a few, a quick recovery and a chance to go back into the fight. 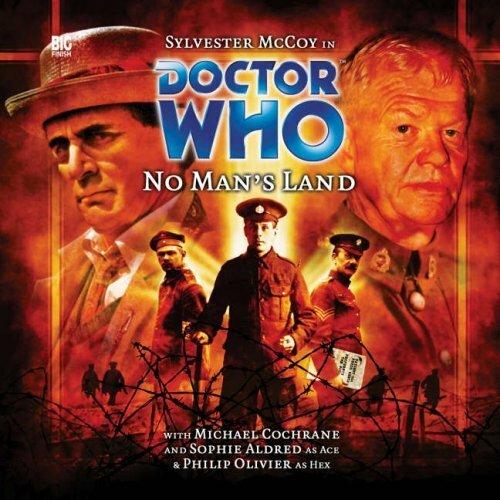 No Man’s Land is another historical serial from Big Finish, with a few hints of temporal metaphysics and mental conditioning. It uses the setting of World War I to great effect, especially through its use of sound, but the story tends to start and stop, racing forward before slowing down and then racing forward again, wasting some very good performances in the process. Martin Day is an incredibly prolific writer who’s contributed heavily to the BBC daytime soaps Doctors and Family Affairs and penned several unofficial guide books to shows such as The X-Files and The Avengers. With regards to Doctor Who, he’s written novels for both the new series (Wooden Heart) and the classic series, with his best known work for Who perhaps being the Eighth Doctor Adventures novel The Sleep of Reason. Knowing Day’s writing pedigree, No Man’s Land would have made a very good book. Day gives listeners a script brimming with plot, hints, red herrings, misdirections, and most importantly a solid cast of secondary characters. The story seems to involve a bit of time travel trickery with mentions of the supernatural (including the Angels of Mons) and the technological (Brook’s mysterious benefactors). But the plot focuses on the soldiers, who have either been physically injured or enduring what would eventually be called “shell shock.” As the Doctor tries to solve a crime that he knows nothing about, the script focuses on the various men. Some are eager to dive back into battle, some are a little wary about going on the firing line again, and one flat out admits he’s a coward. No Man’s Land is a rich script with an interesting story, but the story does suffer from some meandering. Day has penned plenty of television, but such scripts have to be a certain length and not one second over in order to accommodate the episode’s runtime. No Man’s Land is over two hours in length, and there definitely were some moments that could have been better edited to cut out excess dialogue or removed altogether, such as the scene where Ace and Hex come across a cloud of chlorine gas that they easily escape from. John Ainsworth (who also helmed Unregenerate!) shows a steady hand but allows the story to wander a bit. With a novel, it would be easier to overlook a few extra scenes or lines of dialogue, but I found my attention drifting a few times during this story, indicating a pass with the editor’s scalpel was needed to tighten things up. This is most evident during the second and third episodes, where the story doesn’t dip in quality but instead takes too long to make its points. Normally, a Seventh Doctor story involving the military would involve the Doctor raving about the futility of war and the sanctity of life. No Man’s Land definitely provides those moments from Sylvester McCoy, but his first priority is solving the impending murder. It’s a nice insight into the Doctor’s mind; life is paramount, and here’s the chance to save a life, and one life is the most important thing in the entire universe. When the murder does happen, that’s when the Doctor’s inherit distrust of the military system comes into play. It’s a slow build towards the angry outburst, coming as part of the third act cliffhanger, and when it happens, it feels “earned.” These are the kinds of moments where McCoy shines, both as the sly, inquisitive investigator and as the voice of righteous rage during his debates with Brook. In some ways, No Man’s Land mimics the shift in tone that resonated in many of the episodes from the classic series, as the first episode hinges on the murder mystery but the fourth episode focuses on the effects of the hate room on the soldiers and the attempt by the Doctor and his companions to escape them. The journey is a bit bumpy (most of the drag comes in the second and third episodes) but happens smoothly and without any jarring shifts. By this point in the audios, Hex has taken the role that Ace had during the final television season, becoming a student of both the Doctor and of Ace (who, for the time being, seems to have dropped the “Dorothy McShane” moniker. I wonder if it was because some fans were confused that Dorothy was supposed to be Ace). Ace, meanwhile, has become less of a student and more of a teaching assistant to the Doctor as well as an older sister to Hex. From a writing perspective, this does allow for both the Doctor and the more mature and capable Ace to discover things that normally only the Doctor would have discovered in earlier stories. 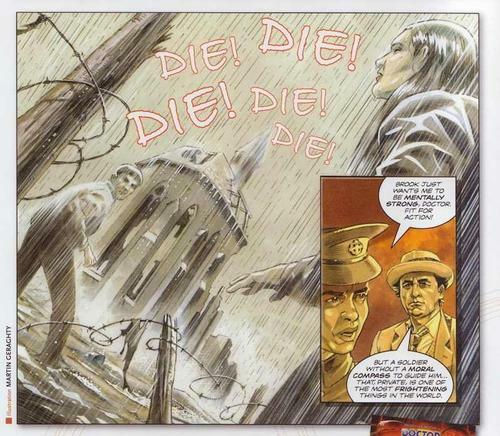 No Man’s Land sees Hex involved in the story a little more than Ace is, but both get their moments; Ace talking about using her feminine charms to draw information from a soldier, and Hex worrying about being smack dab in the Great War and why he can’t help people without mucking up history. We get a few quiet scenes between the two as well where both bring up their families (including Hex’s mother and Ace’s brother!) as well as action scenes near the end of the story where both try to survive their own trip across no man’s land. One thing did disappoint me, though – episode one ends with Hex being locked in the hate room and subjected to a full dose, but aside from frustration with Ace, the effects never come into play during the story. I wish we could have gotten a little taste of how the hate room affected non-soldiers via Hex’s exposure to it. One of my favorite Monty Python skits is the little known “First World War Noises” from Matching Tie and Hankerchief. I mention this only because the World War Noises in No Man’s Land is simply astounding. Not counting the sounds of conflict as rifles fires and bayonets clash, Simon Robinson does his best to add the little touches, background noises such as coughing, the clattering of typewriters, and rain hitting windows that enhance those moments. The sounds of the hate room, both the anger of the English soldiers and the screams and cries of the Boche that drive them to frenzy, will embed themselves in the listener’s memory to endure long after this serial is over. I’m a sucker for war movies and war stories (as I write this review, I’m indulging in my long-running Fourth of July tradition of watching the four-and-a-half hour Director’s Cut of Gettysburg), and as such I did enjoy No Man’s Land for looking at war from the point of the individual soldier, especially the Doctor’s speech about how one soldier putting down his gun when the time is right can make all the difference. The story doesn’t pull punches, but doesn’t come off as high-handed or lecturing. For the casual listener, I would recommend this story with the warning that is does take it time getting to the point in several scenes. This story demands the listener’s attention simply because it’s very easy to lose focus. If one can keep their focus on the story, they’ll be well rewarded. Synopsis – A tale about the effects of warfare on soldiers, No Man’s Land runs a bit longer than needed, but rewards the listener with a tense storyline and great secondary characters. Colin Baker is the Doctor in…The Year of the Pig. This entry was posted in Big Finish Review and tagged Ace, Big Finish, Big Finish Audio, Big Finish Review, Doctor Who, Doctor Who Audio, Doctor Who Review, Hex, Philip Olivier, Seventh Doctor, Sophie Aldred, Sylvester McCoy, The Forge. Bookmark the permalink.